We can create a group tour experience for any size group! Special group pricing for walking and bus tours begins with groups of 15 or more. A group of 20 or more is required for special rates on the Chicago Architecture Foundation Center River Cruise aboard Chicago’s First Lady. For more information, call 312.322.1130 or email groupsales@architecture.org. 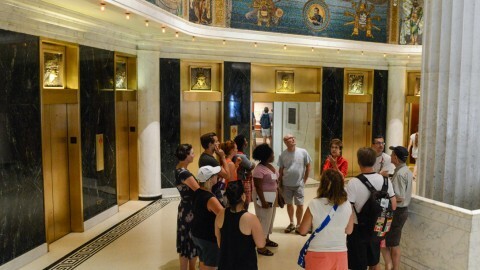 Is admission to the CAC exhibits included in your group tour pricing? Admission to the CAC exhibits is part of your walking, bus or group tour experience and included in the price of your tour. Discounted admission to the CAC is available with River Cruise group tickets. Our tours are designed for ages 14 and older. However, we do offer tours and workshops specifically for students. Visit our Field Trips (K-8) or Field Trips (age 14+) pages for more information. River cruise content is not designed for young children and no student discounts are available. Is there a space at the CAC where our group can eat lunch before or after our tour? No. However, there are many places nearby where you can enjoy a brown bag lunch outside, including the Riverwalk (across the street from the CAC) and Millennium Park (two blocks south of the CAC, off Michigan Avenue). Can you suggest food or catering options? There are many fast-food options available for your group in the Pedway, which is accessible directly from the CAC. Check out our special offers page to find discounts for nearby restaurants. Please note, no food or drinks are allowed around the Chicago Model exhibit. What are the deposit and final payment policies? A 50 percent deposit is due 14 days after booking your group tour, or 30 days prior to the tour date, whichever comes first. The balance is due two weeks prior to your tour departure. Cancellations made at least 30 days in advance of the tour will receive a full refund. Deposits will be forfeited for cancellations made 14-30 days in advance of the tour. No refunds are issued for cancellations made less than 14 days in advance of the tour. Any group reservation not paid in full 14 days prior to the tour date may be cancelled at the CAC’s sole discretion, resulting in forfeiture of the deposit. Can I adjust the size of my group after booking my group tour? Your group size may be adjusted up to the day your final payment is due. After the final payment is made, the CAC can add guests based on availability, but the additional tickets will be charged at full price. River cruise tickets will be waiting for you at the dockside ticket office, located at 112 E. Wacker. For walking and bus tours, a CAC docent will meet your group leader at the starting point of the tour. No tickets are required, but please bring your group contract with you on the day of the tour to check in your group. Where is the bus drop-off? If your group is going on a river cruise or a tour that departs from the CAC, buses can drop off on the south side of Wacker Drive, in front of the entrance to 111 E. Wacker Drive. Groups going on the river cruise will need to walk to the intersection of Michigan and Wacker, cross Wacker Avenue and walk down the stairs on the northeast corner of the intersection to reach the dock. Where is the river cruise dock? The dock is located at 112 E. Wacker, at the bottom of the stairs on the northeast corner of Michigan and Wacker. Look for the blue awnings. Yes. The accessible drop-off level is located two levels under Michigan Avenue and Wacker Drive, on Lower, Lower Wacker Drive (also called the “Service Level” of Wacker Drive). Be aware, most GPS systems struggle with multi-level roads. Click here for printable directions that will bring you to the accessible drop-off location. Dropping off on Lower, Lower Wacker will bring your group to river level, avoiding the need to use the large staircase between the River and Upper Wacker. This location is also less congested and will make it easier to load and unload your group. An ADA-compliant ramp is also located at Wacker Drive and State Street, a few blocks away from the dock and CAC. When you reach the Riverwalk level, proceed east two blocks until you see the blue awnings, just past the Michigan Avenue Bridge underpass. To book your group tour or for more information, contact our group sales department at 312.322.1130 or email us at groupsales@architecture.org. Interested in receiving our group tour newsletter? Sign up and stay in touch.